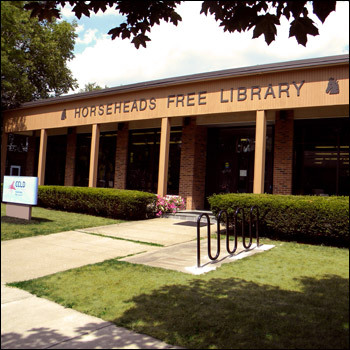 The Horseheads Free Library was started in 1944 by Ruth B. Leet and other members of the Horseheads Woman’s Club. After the donated collection outgrew two rooms over Brown’s Drug Store in Hanover Square, it was moved to the second floor on the old Fire Station Annex on John Street (1949-1961). Upon receiving its charter as a free association library in 1958, an official affiliation with Steele Library began and a salaried librarian was hired. Successive homes were found within the Hanover Square Marine Midland Bank (1961-1962) and in the new Village Hall (1962-1967). Architects Fudge and Underhill planned the current building, named after Mrs. Leet, and it was built by McLane Construction. William A. Danaher, Jr., was Board President during most of the fundraising and formative years of the library. Having concluded that a building expansion was not feasible, the Board of Trustees authorized an exterior facelift in 1997 which was then upgraded to include a major interior renovation with considerable assistance from Chemung County. Structural changes included altering the size of the meeting room and creating a public restroom with handicapped accessibility. The final portion of the remodeling was completed in 2000 with the installation of category 5 cabling, again with assistance from Chemung County. In addition to over 54,000 books, there are videos, compact discs, DVDs, CD-ROMS, magazines, books on tape, media sets, electronic databases and Books Plus kits bringing the total collection size to 63,000+. Very few libraries exist without the help of numerous volunteers and a staff dedicated to service and knowledge. We are pledged to supply the community with the best of both.